Would you like to get certified to teach Hot Barre? 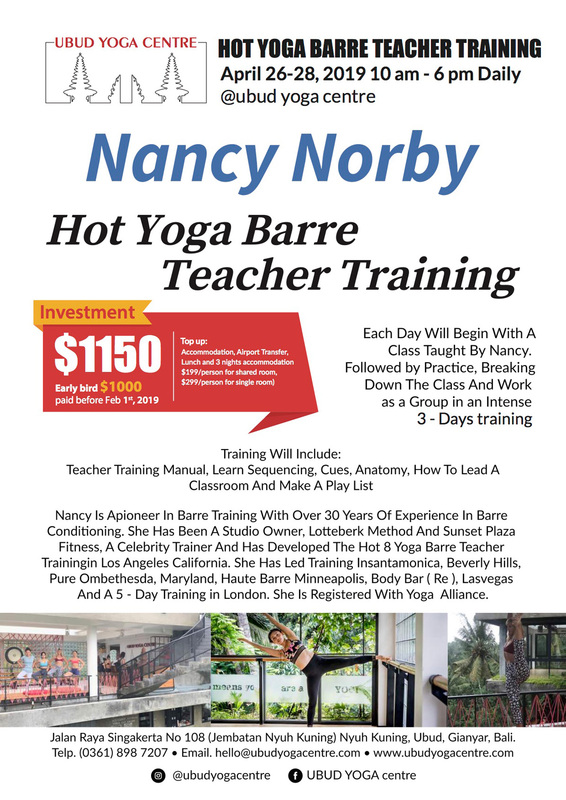 Come join Nancy Norby Hot Yoga Barre Teacher Training in Bali, at April 26 – 28, 2019. You will be given a teacher training manual. Learn sequencing, cues, anatomy, how to lead a classroom and make a playlist. You will begin the day with a class taught by Nancy. We will practice break down the class and work as a group in an intense 3 day workshop. At the end of the 3 days you will be issue certificate of completion. Nancy is a pioneer in Barre training has over 30 years of experience in Barre conditioning. She has been a studio owner, Lotte Berk Method and Sunset Plaza Fitness, a celebrity trainer and has developed the Hot8 Yoga Barre Teacher Training in Los Angeles California. She has led trainings in Santa Monica, Bev Hills, Pure Om Bethesda, Maryland, Haute Barre Minneapolis, Body Bar(re), Las Vegas and a 5 day training in London. She is registered with Yoga Alliance.